Holly Bloggy Christmas Recipe Party and Sweet Kiwi Crochet Giveaway!!! It’s Holly Bloggy Christmas Week and time for the Recipe Link Up!! There is also a great giveaway from Sweet Kiwi Crochet for you today! I can’t tell you how honored and excited I am to be part of this year’s Holly Bloggy Christmas put on by Simply Sweet Home! Yesterday was the first day of the event, where you linked up at Tatertots and Jello to show of your Homemade Gifts (If you haven’t yet, be sure to go do so!) Today is day two, and you get share your Christmas Recipes! I am so excited to see all your recipes and I know others are too! If you want the rest of the Holly Bloggy Christmas Schedule, be sure and check the “Holly Bloggy Christmas” Tab. You don’t want to miss you on any of these parties! Tomorrow you can link up your Christmas crafts at Just Sew Sassy!Christmas is such a fun time of year. People seem to be extra nice, stores always have great sales, family gets together, and there is a definite peace about this season. This time is also fun because there is a lot of gift-giving between family, friends and neighbors. I love making up neighborhood gifts to give out. Do you like chocolate chip cookies?! 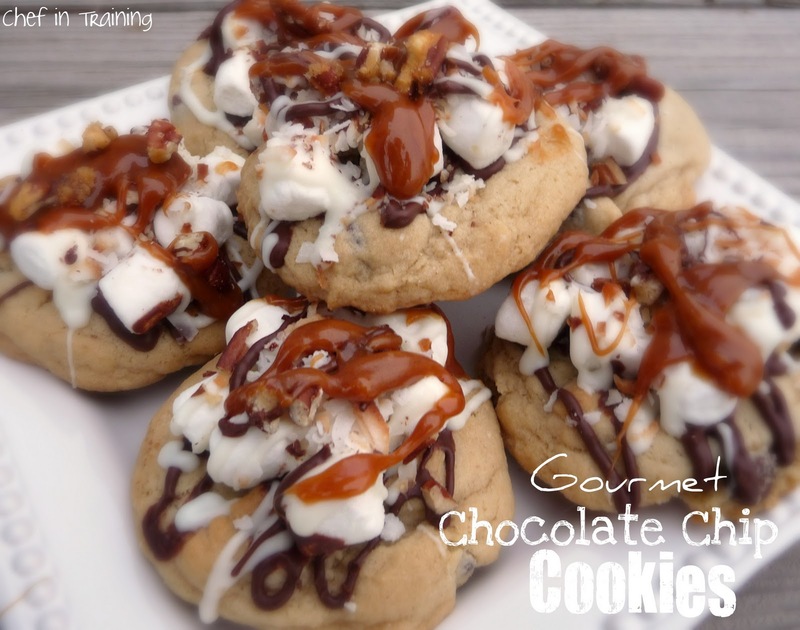 Well then you are going to LOVE these gourmet Chocolate Chip Cookies! Put shredded coconut on a cookie sheet and broil until toasted.Cream butter and sugars together.Add dry ingredients and mix together.Add semi-sweet chocolate chips Bake at 375 F for 8-10 minutes.Melt white chocolate chips and semi-sweet chocolate chips and pour into separate ziplock baggies. snip off a tiny tiny corner and drizzle over cookies.Put on some mini marshmallows over the wet drizzled chocolate.Drizzle both chocolates again over cookiessprinkle on some toasted coconut.Melt some caramels and drizzle over the tops. Line a 9″ square pan with foil.In a medium pot over medium heat, bring the sugar, butter and milk to a rolling boil, stirring constantly. Stir in chocolate chips and marshmallow cream until completely smooth. Stir in vanilla. Pour into your foil lined pan and allow to completely cool. 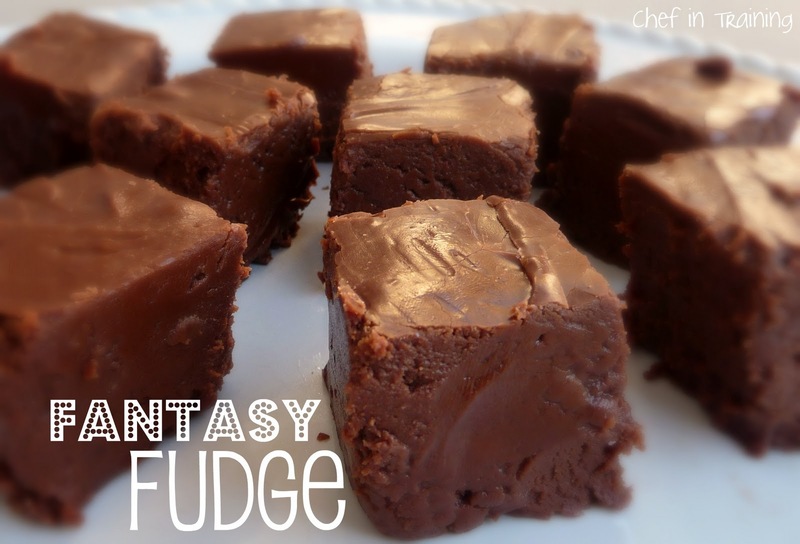 Lift the fudge out of the pan by the foil liner. Cut to the size you desire. Today, I have an AMAZING giveaway for you! I want to introduce you to a company that makes just about the cutest and some of the most creative beanies you will find, Sweet Kiwi Crochet! I absolutely LOVE all of her beanies! She has a wide variety of styles and sizes from newborn to adult. Here in Utah, it is pretty cold to say the least and hats for my little ones are a must have!My daughter and her sock monkey “Moe” are inseparable. She can’t go or do anything without him. When I saw this sock monkey beanie, I knew it would be PERFECT for her! She adores it and wants to wear it every second of the day. For my boy, I instantly fell in love with this monster beanie. It is so fun and unique…and pretty cool if you ask me! well, guess what? 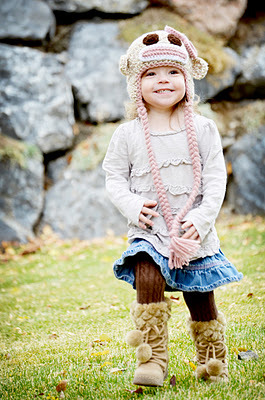 !Sweet Kiwi Crochet is giving away one adorable beanie of the winner’s choice and size!!! Those hats are so cute! I follow your blog. the sleepy owl is my favorite but they are all very cute! Great party Nikki! Thanks so much for hosting with me!! I like Sweet Kiwi Crochet on FB. I would LOVE the Skunk one. SO stinkin' adorable! I'd love to win the purple awake owl ! I like Sweet Kiwi Crochet's dog beanie! I am a follower of Sweet Kiwi Crochet's webpage! I follow Sweet Kiwi Crochet. My favorite beanie is the chick one...We happen to call our daughter little chickie so that would be perfect for her! THose are the cutest hats ever!!! I follow you for sure!!! You always have the greatest food here...those cookies are amazing!!!! I'm a new follower! Great Blog! Everything looks delicious! 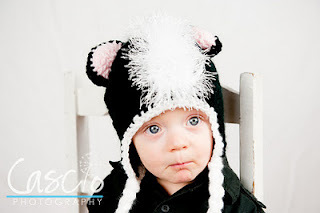 These hats are so darn cute! Love the sock monkey one. Liking sweet kiwi crochet on FB! I love the pink headband with the big white flower! Thanks so much for hosting. tonight might be the night the fudge gets made here. The hats are so cute! I love the monster one for my 6 month old! These are the most adorable beanies! I love the monkey one. I am a follower of Chef n Training via gfc! "Liked" you on Facebook!! Happy holidays! I am now a follower of Chef in Training! I like Chef in Training on facebook. I follow Sweet Kiwi Crochet's website! I LOVE the owl beanie!!!! I'm torn between the purple owl and the skunk! So cute! my fav is the giraffe beanie! I am a follower of you and I didn't realize you live in Utah! I grew up in North Ogden where my family still lives. Great giveaway! I love the pink or red sock monkeys. Adorable! I already like CIT on facebook too! Adore the pink sock money beanie! Your just mean! Those are the best chocolate chip cookies I have ever seen! Oh these are too cute!! I love the owl! My daughter would fall in love with the monkey! I'm a chef in training follower. I follow sweet kiwi crochet blog. 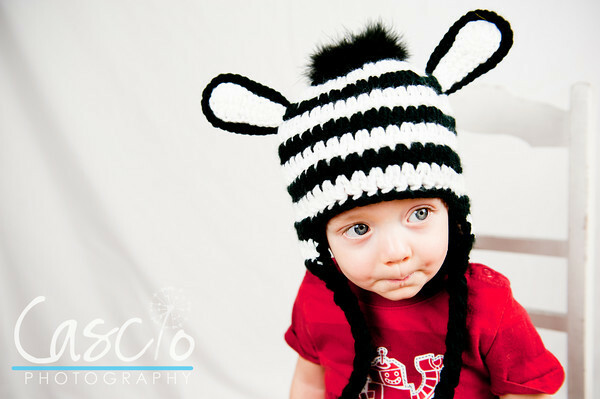 The zebra hat is my favorite! I became a follower of your wonderful blog!! I "liked" your facebook page for another chance to win. 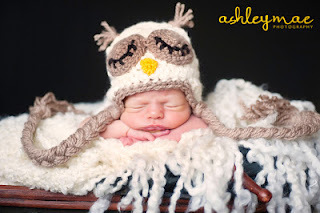 I visited the Sweet Kiwi Crochet blog and think the OWL hat is adorable!! Love it!! Enter me in a chance to win it for my granddaughter please!! I LIKED the Sweet Kiwi Crochet facebook page for another chance to win a CUTE HAT. I became a follower of Sweet Kiwi Crochet blog for another change to win. I emailed my friends about your website, bloghop and giveaway for another chance to win. I liked chef in training on fb! I love the Classic Sock Monkey Crochet Hat! I am a follower of yours already! I love the sock monkey beanie the little girl has on! ADORABLE! I follow u & her now on FB as well. I follow Sweet Kiwi's blog. I follow Sweet Kiwi's facebook page. I love the sock monkey!! visited sweet kiwi and LOVED the owl hat for Kendyl! I follow sweet kiwi on facebook! I sent out a facebook post about this giveaway! What a fun site she has! I love the lady bug beanie! I am following you! Love it! 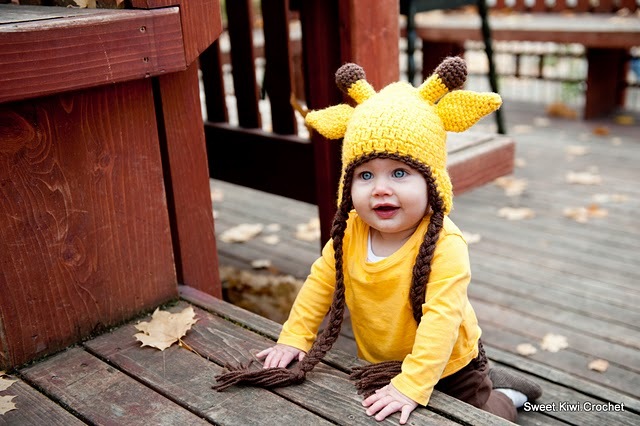 I am in love with the giraffe hat. Might have to have it for my son. Liked Chef In Training on Facebook - you are one of my new fav blogs! So Happy to have found you from Just Sew Sassy! Liked "Sweet Kiwi Crochet" on Facebook Her products are adorable! Follow Sweet Kiwi Crochet's website- too exciting!!! Be a follower of Chef In Training - cannot wait to try some of your recipes! Fav Beanie- the 'Moe'. My 3yr old Elise loves anything monkey, and only wants monkeys from santa..
Just became a follower of Chef in Training! Love your blog! Just liked Sweet Kiwi on Facebook! My favorite beanie is the sleeping owl! I would love to see my daughter in that one! I follow your blog ~ I love cooking & baking & looking forward to trying out the oreo truffles!! It's hard to choose a favorite, but I love SKC sock monkeys & sleeping owls. I am following your website! 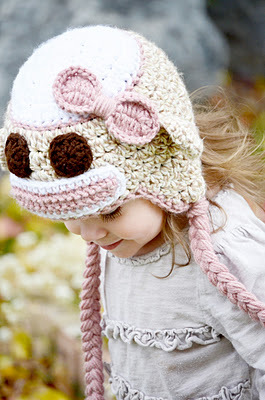 I love the pink and light brown monkey beanie with the pink bow, it is precious! I have been a follower for a while and now I am following this wonderful Chef in Traning. I love the little pink monkey or the sleeping owl. I have comments and liked, followed on all of the above requests. :] Thanks for sharing your wonderful talents!! So sweet! I liked you on Facebook! Liked Sweet Kiwi Crochet on Facebook! 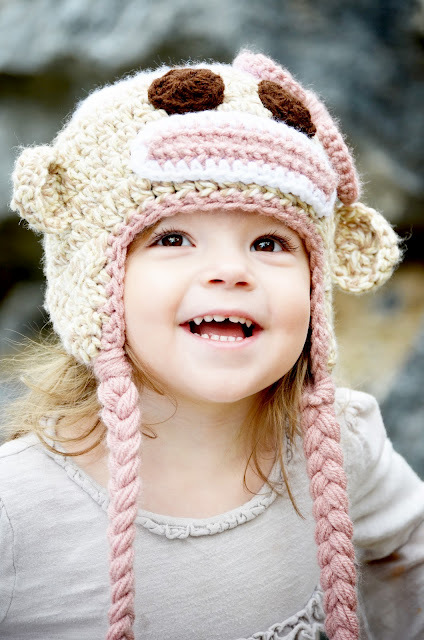 She has some amazing designs, but I love the pink sock monkey hat the best!